When people have a fear of KPIs, of under-performance or bad decision-making being exposed, performance cannot improve. We have to kill the fear of KPIs. And we can. 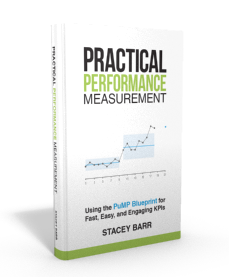 In almost every conversation about KPIs and performance measurement, the elephant in the room is the fear people feel about KPIs. They all know it’s there, it’s big and smelly, but no-one wants to talk about it. What has put this fear there, in the room, is the belief that one person has full responsibility and control over the KPIs assigned to them. Of course, they won’t directly admit it. They don’t want to appear weak or cowardly or not cut out for their job. But indirectly, this fear of KPIs manifests in debates about the integrity of the KPIs, the lack of resources to reach targets, the difficulty of getting the right data. What we don’t debate, and should, is the belief responsible for this fear. We can kill this fear with a single blow, or by hacking away at it. The single blow requires some degree of effort and preparation. But it’s easy to start hacking away at that fear immediately, with small but continuous hacks. 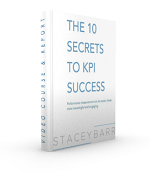 Kill the fear of KPIs with a single blow. The belief that put the fear elephant in the room, that a single person is in control of reaching KPI targets and if they don’t it must be their fault, has to be called out. Be brave enough to point out the belief, and how illogical and incorrect it is. Unpick where the belief came from, what keeps it alive, and why it’s so uncomfortable to let it go. Insist that we have to stop judging people with KPIs, stop expecting to hit targets every time, and stop using KPIs to compare performance between people and teams and even organisations. Negative and unconstructive emotions always come from these things: judgement, expectation and comparison. Invite everyone to collaborate in overhauling the performance measurement process, to focus it on measuring organisation goals and processes, on learning about what improves performance and what doesn’t, on reaching for targets rather than hitting them. This conversation will need time. It should be open, non-judgmental, with time for everyone to be heard. You might even benefit by bringing in an impartial facilitator who simply manages the participation. Executed well, this conversation will deepen the team’s trust and their hope and courage to strike down the fear-causing belief in a single blow. Steps to start hacking away at the fear immediately. We shouldn’t ever wait for the planets to line up and ducks to get into a row before we act on important things. Perfect timing and perfect circumstances are like hens’ teeth. So is the perfect amount of team trust and collaboration to have a conversation that strikes down KPI fear in a single blow. Do your utmost to visually and verbally align all KPIs to the business process results they monitor – not to names, positions, teams, or departments (not to anything that can pinpoint specific people). Never report a KPI without context – historic performance, knowledge about what does and doesn’t improve it, constraints currently holding it back, and likely solutions to remove or ease those constraints. It’s a story, not a tick-and-flick exercise. Change the meaning and consequences of KPI ownership. Instead of kicking bums for targets not being reached, hold people accountable for monitoring the right KPIs, interpreting them validly, and initiating action only when it’s needed. Adopt the discipline to ask three and only three questions about a performance measure: what is it doing, why is it doing that, what can be done about it. Never ask who is to blame, why it isn’t already hitting target, or what are the excuses we can make. Don’t misinterpret a KPI by making limited comparisons that lead to false conclusions. Understand each measure’s natural variability and only look for statistically valid signals. Conversations based on false interpretations erodes trust. Do you believe that individual people can be in full control of a KPI hitting a target, and and that they should be held accountable for this? None of the suggestions above will be useful to you if you do. If you truly want people to contribute their best, collaborate constructively and improve performance of the organisation, you have to let that belief go, or you’ll never kill the fear of KPIs. If people fear that KPIs will expose under-performance or bad decision-making, performance can’t improve. We have to kill the fear of KPIs. What practices are you using now, to kill the fear of KPis in your organisation? Great post Stacey and very timely. I’ve joined a new organisation where KPIs are just seen as a stick to beat people with. When they talk about using KPIs for performance management they are talking about individual performance management. I’ve started by educating senior managers that KPIs should measure business process performance not individual performance. Once they’ve put their sticks down it’s then a case of going to middle managers and saying it’s OK to report on KPIs that aren’t where we want them to be. In fact you should want to report these struggling KPIs because they allow you to flag up where further support may be needed. I so agree with you, Chris. It’s a tough bad habit to give up, but when we keep at it, not giving in to tradition and “how it’s always been done here”, we can influence it. Hi Stacy, I have just been practicing XmR charts but I get stuck in interpreting the information/data. Do you have a guide on the interpretation of the information/data? 1) Read Donald Wheeler’s incredibly good book, “Understanding Variation: The Key to Managing Chaos”. It’s essential to learn XmR charts properly, like any technical process, to avoid making the common mistakes. Another great post Stacey. In the whirlwind of forces at work in our businesses, I think we sometimes lose sight of our purpose as leaders. I love this quote from W.E. Deming, “the aim of leadership should be to improve the performance of man and machine, to improve quality, to increase output, and simultaneously to bring pride of workmanship to people. Put in a negative way, the aim of leadership is not merely to find and record failures of men, but to remove the causes of failure: to help people to do a better job with less effort”. Kim I hadn’t come across that Deming quote before, and I love it! Thanks for sharing it… I think I will be able to use it in my future writing, for sure.